My team is eleven games into our season and I haven’t been happy with our competitive instincts. I feel we are not winning enough 50/50 pucks and not winning enough loose pucks. Over the past few weeks I’ve started running drills in practice specifically designed to work on these skills and as of today, I’m happy with the results I see from the players. 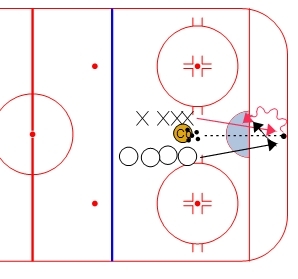 All of these drills can be considered Small Area Games and I will post them in that section of the site for future reference. The team really gets competitive with this drill. I split the team into two groups and they compete against each other. The action gets pretty intense at times and really teaches the players how to win puck battles. I picked this one up off the Coach Chris Hall site and it is intense. The players have to work in very tight areas and compete along the walls. 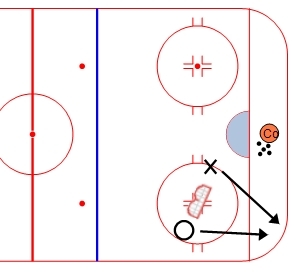 This drill is the typical corner battle. 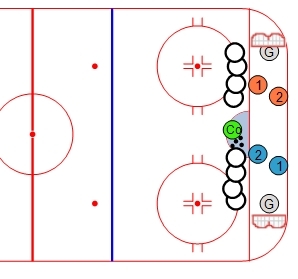 Using it causes the players to work on the physical part of the game as well as tight area puck protection. Reblogged this on Taro Says.